While Gwen suffers from frequent nightmares, she can’t complain about her life. She has a unique job with a boss who she may or may not have deep feelings for and a small close-knit group of friends who she trusts with her life. When the nightmares start to seemingly become part of her reality, Gwen hopes a fun night out with her boss and friends will be the cure to help rid her of her waking terrors, yet the near perfect evening turns into a nightmare itself. A journey of survival soon begins where no one can flee from the ancient evil powerful presence that has made itself known. The only choice is to fight, but how can normal humans fight a god-like deity? A discovery of ancient bloodlines that can take on the deity is soon discovered and there is a light that can potentially pierce the darkness; however, with an army of monsters at this great evil’s disposal, who will survive the battle that is surely to come? 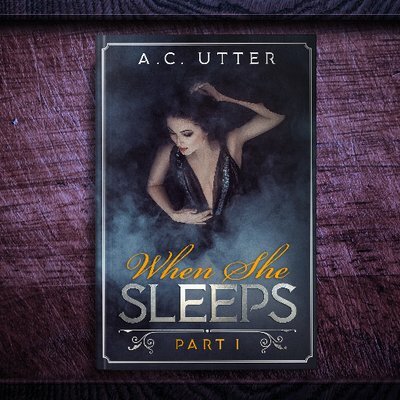 Author A.C. Utter has entered the world of writing as today marks the release of her debut novel When She Sleeps: Part 1. This new horror fiction is the first part of a series of unknown length and has proved to be the start of a series with an array of possibilities as to where it could go moving forward. The story itself is most certainly intriguing and offers a great story to capture readers’ attention; however, it is also a story that could have used just a bit more development to really captivate its audience and to truly pique their curiosity. As aforementioned, Utter has started a series with so many possibilities. It is a story that could go in so many different directions, readers will most certainly be curious as to where it will lead in Part 2. It is a story where characters are traversing through dreams and reality. With a plot along the lines of Nightmare on Elm Street, who wouldn’t be intrigued? Add in an ancient god-like force, magic, and a mythological creation story similar to that of fantasy author CM Kerley’s Barclan Series, readers will be sold on picking up a copy of When She Sleeps. Paired with this intriguing story line, readers will also be introduced to Utter’s writing style. She does a beautiful job of describing morbid and horrifying scenes, creating an incredibly vivid picture within the reader’s mind to truly bring to the life the genre of her story. She also does an excellentjob of playing with the reader’s mind, beginning with a calm sort of feel to the story, then leading them into a grimmer place, then moving back and forth between light and dark before taking its more terrifying turn. This helps to keep the readers on their toes, not knowing what to expect. As for the characters, Utter most certainly knows how to write strong female characters. She has added a number of women to the roster of powerhouse women characters in literary fiction as readers will find no damsels in distress in this story, which is most certainly a breath of fresh of air for today’s fiction. Another nice feature about the characters is that within such a dark and grim story, there is a lot of love that can be found. Whether the characters were longtime friends or family or complete strangers they had just met, all of the main characters truly care about one another. They care about each other so much that they will fight to protect one another and they get along really well, proving that even in the darkest times, light shines through because of the power of love. While When She Sleeps has many highlights and has many factors that will create an excellent read for readers, there were some parts that could have used more development that would have made for a truly phenomenal debut. For instance, this story was meant to be a story in the horror genre. Horror usually either frightens the readers right away or builds up the suspense to create one terrifying tale. While Utter does introduce her terrors rather early in her story, the story itself seemed a bit rushed. It seemed to rush through introducing characters and the story behind the rising evil so that readers could get to the inevitable conclusion of the book. This seemed to take away from the building suspense and horror, making the story read more like a fantasy novel with a bit of thriller/ suspense thrown in. This first part would have also benefited if it had been more of a slower paced introduction and moved a bit slower to really add the suspense and the horror to the genre it was written for. While each character is introduced and is given a brief look into his or her personality, readers do not get to truly connect with each character individually and may wish to find out more about each of them. Come close to the end of the story, readers may start to see the characters all somewhat acting similarly. Not to mention, once all of the evil intentions are revealed, the characters seem a bit too calm and collected about what they will be fighting against. In all honesty, one would not believe a normal human being would act like this upon learning of this great evil threatening life itself. In the next installments of the series, perhaps readers will get more of an in depth look to each of the characters’ unique personalities and then readers will be able to truly fall in love and follow one or more characters as they read. Utter is a new author who has most certainly made an impression with her debut When She Sleeps, the first in a series that promises so much potential for future books. While it does not read so much as one would expect a horror novel to read, reading more like a suspenseful fantasy, it has an intriguing mythological background that will grip readers’ attention and the love the characters feel for one another creates a nice light in a dark and grim tale. Some more character development and a less-rushed storyline would have created more feelings from readers towards the characters and more suspense and terror felt leading up to the conclusion; however, there are more stories to come and more time to develop what has not been as focused upon in Part 1. Readers are in for a treat as they begin this new series for it introduces a new author’s writing style with excellent descriptive detail and so many loving characters that are rare to find in stories nowadays. It is also a book that introduces a new series with so many future possibilities. Readers will have no idea where this new series will lead and upon completion, readers will want to know what happens next.